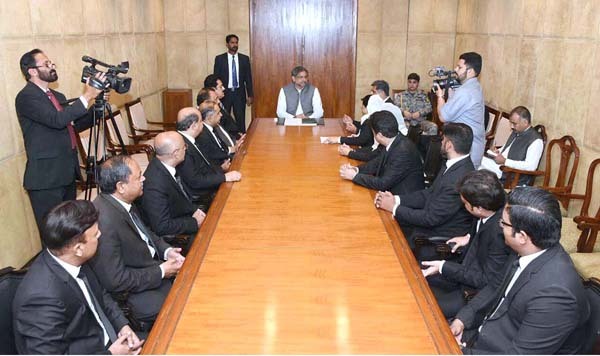 ISLAMABAD, May 4 (APP):Prime Minister Shahid Khaqan Abbasi Friday said lawyers had a critical role in dispensation of justice and expressed hope that the country’s legal fraternity would continue to play role in strengthening of judicial system and provision of speedy and affordable justice to the people. The Prime Minister expressed these views in a meeting with the delegation of High Court Bar Association Rawalpindi Bench and District Bar Association Rawalpindi here at his chamber in the National Assembly. The Prime Minister appreciated the struggle and sacrifices of the lawyers’ community for democracy and rule of law in the country. He also assured the delegation that every possible effort would be made to address their issues. The delegation highlighted the role of lawyers’ community towards rule of law and strengthening of democracy in the country. The issues faced by the lawyers’ community also came under discussion.